This is a hugely familiar story that I hear waaaaaay to often. You have decided to take the plunge and set up your own cake business. Or you are running it now and whilst things are going ok...you are stuck living in this horrible ground-hog day moment being afraid that you will fail. So you just keep doing what you are doing because you are not sure how to move onto something else in cake that will work better for you. And it affects every decision you make. Should you jump in to running the business full time? Should you give up your job? Should you start teaching classes or online? All these great ideas that you have but all of them are held back because you are worried that you will fail. And if you fail, you will be in a mess, right? Every single entrepreneur I have ever met is afraid of failing. It is about as human as it comes. You like to know that you are safe, that nothing unexpected will happen. And jumping into something new means that you don't know what will happen. So your brain handles that by making you feel fear - a fear that you will fail and a worse fear that you won't be able to cope with failing. As a result, you get paralised in your own fear and cannot move forward. A little bit of uncertainty or fear about the future is all well and good if you can keep it in check and rationally analyise when you are likely to succeed or fail. The problem arises when you cannot see the wood for the trees. When you become so scared of failing that you stop moving forward even when you know that you need to move forward. When you continue doing things that just don't work purely because you know HOW to do those things. They are safe. They don't work, they don't make you any money, but they are safe things to do because they are familiar. What feels unsafe and unfamiliar is jumping into something new. You know you have to do something different to make your business more likely to succeed but in that balance between determination and fear of failing, the latter often wins and you get stuck in a rut of non success. And in the worst case scenario, you throw in the towel completely. This blog post is about how you can learn to use failure to your advantage. Overcoming a fear of failure is not easy and a multi pronged approach is the best way forward. These 5 strategies are things that I have done in the past to move aware from being scared of failing. I therefore know they work. For 100s of tutorials covering all aspects of running a cake business - from marketing to dealing with fear of failure as well as recipes, videos, pictorials, masterminds, member perks and an awesome community, join the Pretty Witty Academy. It is the best online cake and cake business school in the world. 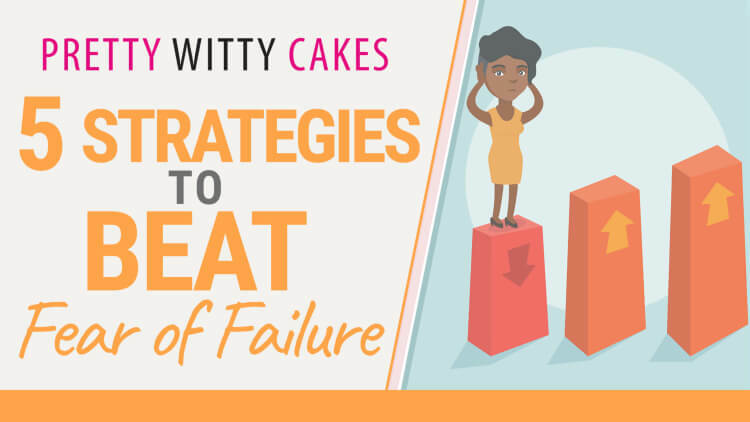 A fear of failure with your cake business is often linked to cake making being a hobby or a job which can frequently cause overwhelm. You often have multiple clients to juggle or you may have classes to run around making cakes, blog posts to write and emails to deal with. And that is not even mentioning children who have their own demands and timetables. If you haven't got tried and tested systems for managing all of this in place, it can easily get on top of you. Or, if you have systems up and running but then get sick and cannot work, it is all too easy to feel overwhelm. The secret is to simplify what is making you feel overwhelmed and what is making you panic. STOP WORK! Right now. Take some deep breaths and a piece of paper. Set a timer on your phone and for 45 minutes just write down all the things that are making you feel panic'y. Once you have the initial list, you can then start to write things in a order that you need to do them. You can then break that into days and weeks and put everything that does not need to be done today under a new heading. From there you promise yourself each day to just focus on the jobs on that list for that day. Don't even look at the other lists. Simplifying things like this makes a huge difference and helps remove the fear of panic which leads to a fear of failure. Have you ever met someone who had never failed? All those beautiful instagram feeds or 'overnight' successes? Heck no - behind every beautiful Instagram photo are 100s of others that show the real life, the ugly shots with people upset, tired or frustrated. Behind every overnight success are years of hard work and determination. And behind anyone, and I mean anyone, who had been successful is a history of failing. Failing is how you learn and if you have never failed at anything, you would have a pretty low experience level. 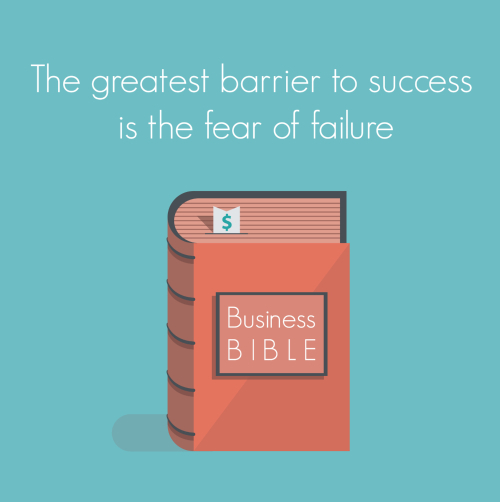 Some of the best entrepreneurs in the world have failed businesses in their history. It is where they learnt to succeed. You need to recognise that you will fail in some aspects. Whether that is not making enough money initially or something else. It is a failure that you can then break down and focus. Why didn't you make enought money? What can you do about it? Can you get a mentor? Can you get training? Can you begin to understand where it went wrong so you don't make the same mistakes next time? If you succumb to your fears instead of pushing fear away, you will not ever experience success. When I built this website (www.prettywittycakes.com) and the new Academy website (www.prettywittyacademy.com) I knew zero about building websites. But I didn't let my fear that I would fail if I tried stop me. Yes it took me longer than I expected but I kept on going. Things may get hard, tough, exhausting or frustrating but once you ride those things out, you will come out the other side with success. And don't forget, the fear of failure will rise up to its highest level, just as you are about to break through and become successful. Don't let it win - kick it out of your path and march on. If something goes wrong in your cake business, do you stop and give up forever? No. Failure is a temporary thing and therefore, by its very nature, is something that will pass. It might feel like the failure will last forever but it won't. What can last forever is your thoughts - you can literally keep thinking yourself back into failing going round and round and round like a broken record. You need to stop letting your negative thoughts affect your future. Who says that you will always fail? No one - but you - right? If a friend was saying stuff like that about your efforts in business, you would ditch them. So ditch your negative thoughts and start telling yourself that you will NOT fail. A fear of failure is often routed in childhood. If you were constantly hearing "you must not do that" or "don't do that" you grew up learning that if you do do things you could get in trouble. Subconciously you then start to think there can be negative consequences for most actions - and a fear of failure develops. What was/am I so afraid of? What happened/will happen when I did/do it? What did or will I learn from this situation? What are 3 positive things that did or will come out of this situation if I do it? These are tough questions because it is hard to look at things in the past when you failed and see what the positive things were. But it is worth doing. If you stick to this, you will start to begin to understand more about yourself and how your mind reacts to certain situations. Failure: I tried to run live classes but no one booked? Fear: If I try again no one will book? Question: Did I ask why people didnt book? Was it cost, time, quality of class etc. Can I find out more information?. If you then find out people didn't book because the class was not interesting enough, you can change the class and try again without fear of failing for the same reason. If they say it was too expensive, lower the price for the first 10 people booking and eliminate the fear of failing based on costs. Work out each question and answer and then change what you do the next time based on those answers. During our working lives, and in making cakes and/or running a cake business, we get so over focussed on the end goal, the end product that we often forget that the entire point is to enjoy the journey along the way. It is fine to look forward to the future but you need to stay in the present and enjoy the journey between the present and the future. One of the ways you will fall in love with your business is if you not only enjoy what you are doing but if you also enjoy the journey. If you focus on the here and now and how you can conquer the small things that are happening now rather than constantly worrying about whether you will achieve the huge goal set for the future this will eliminate some of the panic and fear of failure. Watch this short 7 minute video and just sit back and absorb the words. And every time he says "music" imagine the word was "cake"... Switch everything else off when you watch this and just listen. Now apply it to your situation - are you so focused on the successful end that you have forgotten the dance, the music and the journey. The journey that your cake business gives you is the point. Not the panic that it won't work out. Let it fail sometimes. Let yourself make mistakes and not worry about them and spend your business live enjoying the journey. Words by the philsopher Alan Watts. Video by Wiara on YouTube. There are a whole heap of things that come together to make you fear failure. But it is actually just an irrational and self taught fear. You were not born like that. You therefore need to not let it take over and take steps to recognise when you have to fight back against the fear. Using some of the strategies mentioned above within your cake business will 100% make a difference.